Demand for oil and natural gas pipe is forecast to grow 11 percent annually to $15.4 billion in 2022, a strong recovery from severe declines seen during the 2012-2017 period. Growth will be driven by an expected increase in drilling activity as oil prices continue to recover from 2016 lows. Increased well completion in key fields like the Permian Basin is supporting gains for OCTG, while bottlenecks in such productive areas are encouraging pipeline construction.These and other trends are presented in Pipe: Products & Markets, a new study from The Freedonia Group, a Cleveland-based industry research firm. Growth also will be supported by a modest recovery in pricing. During the 2012-2017 period, weak domestic demand for oil and gas pipe and a surge of steel pipe imports — particularly of OCTG — held prices down. Going forward, producers will likely raise prices for oil and gas pipe due to increased drilling activity and an expected reduction in import competition brought on by the Trump administration's 25 percent tariff on steel and recent anti-dumping measures. Demand for pipe overall is forecast to advance 6.6 percent annually to $51.1 billion in 2022, rebounding strongly from declines posted during the 2012-2017 period. The oil and gas market will remain the largest outlet for pipe through 2022 and is expected to post the fastest growth of any market due to an expected rebound in drilling activity. Increased building construction activity will support demand in a variety of markets, including water distribution, conduit and DWV pipe. 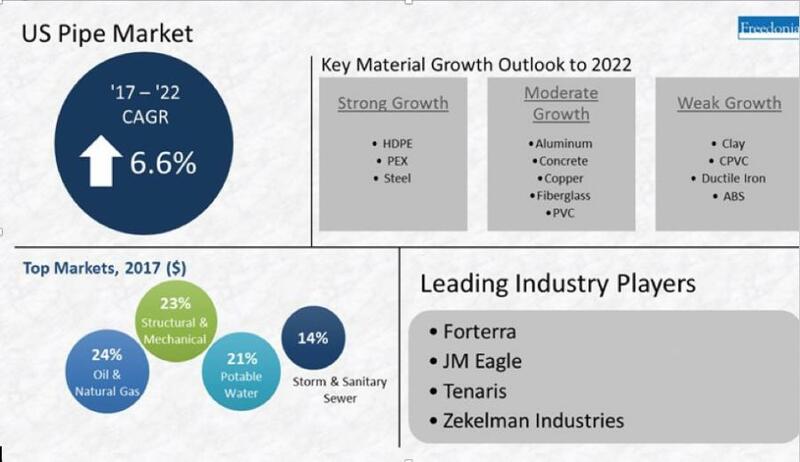 The potable water and storm and sanitary sewer markets are expected to offer the best growth opportunities for plastic pipe, as plastic pipe costs less, is easier to install and is more resistant to corrosion than metal types. Pipe: Products & Markets (published 01/2019, 263 pages) is available for $5,800 from The Freedonia Group. For more information, visit https://www.freedoniagroup.com/Plastic-Competitive-Pipe.html.